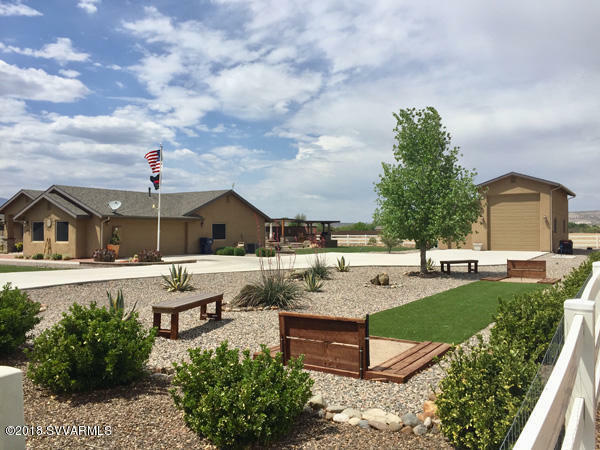 Come see this beautiful home in newer sub division of Equestrian Estates with Verde River access. This 3/2, 2.5 car garage, 1850 sq ft home has a resort atmosphere. Built in 2013, this home has some great custom touches with a beautiful kitchen, granite counter tops and stainless steel appliances. Master bedroom has large bathroom with a walk-in closet complete with custom cabinets. Two guest rooms also have custom storage. Hunter-Douglas blinds throughout the home and 80% UV protected exterior screens keep things cool. The .88 irrigated acre lot is completely fenced with 3 rail vinyl fence and gate. A detached 26'x 40' RV garage complete with swamp cooler, 50 amp service and dump station.